Do you want a valuable addition in your backyard landscaping features? There is no better way of doing it than adding a fire pit which not only makes your backyard attractive but more functional. Fire pits provide warmth, light, cooking source and off-course the ambiance ultimately letting you enjoy a good family gathering where you can enjoy, get entertained and chit chat. Although, this is not a new feature in the architecture or interior designing industry but in Pakistan the style is now getting a tremendous popularity because the trend-savvy homeowners want to add maximum latest features to their dwellings. Choosing an ideal design and getting it constructed by a professional architect in Pakistan you can make it an ideal feature of your outdoor landscaping. An ideally constructed fire pit gives an attractive view of your outdoor from the inside and all around. 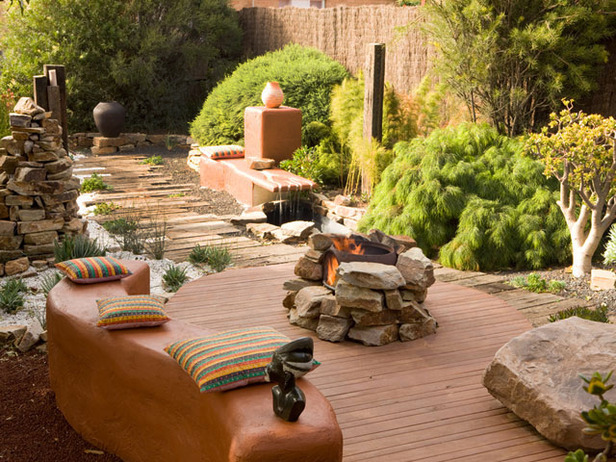 This additional feature of landscaping has various shapes, sizes and designs. However, you need to pick the one while keeping the overall landscaping and available space in view. Now in the markets there are available ready-made fire pits which can be moved anywhere around your backyard or you can opt for a built-in fire pit that must be installed by professionals. When it comes to getting a built-in fire pit, there are available a number of options at your disposal which include concrete, stone, stone and brick. Depending upon your choice you can have an L-shaped, triangular or custom-based fire pit. There are involved following simple steps in its making. You first need to prepare a foundation at the area where you want to make a fire pit. Most of the time, it is given a circular shape; however, depending upon your chosen shape and size you can mark the land and then start digging up to a depth of 6 inches. Suppose if it is in circular form, then after first 6-inch digging you can mark an inner circle 12 inches from the outer one. This will be the inner wall of the fire pit. Prepare the foundation to lay stones upon it. For this you need to mix concrete with the water and make a consistent mixture. In the space between the two circles, you are supposed to lay the concrete to make it leveled to the ground. Empty the central area for the proper water drainage. Start pouring concrete until it reaches the 1-1/2 inches below ground level. Let it for 24 hours to get dried. After the settlement of the foundation you are supposed to lay stones. Mix mortar and pour it on the concrete base up to 2 inches. Lay the stones on the mortar base and start making a wall. As the outer wall starts taking shape, you need to begin building the inner wall. Both the inner and outer walls are bonded with each other with the help of mortar. As the inner and outer walls reach to their completion, you need to give them a finishing touch by filling up the gaps and scratching away the excessive mortar. During construction, you must keep checking the size and shape so that a proper fire pit is built without an error or discrepancy.